Calling all yoga and movement teachers. Innate Integrity is bringing you the opportunity to reframe, deepen and upskill your functional anatomy knowledge and personal practice. In a series of practical workshops Osteopath Dr. Erwann Fabre and Chiropractor Dr. Jacob Nell will inspire essential new ways to review anatomy through the lens of palpation, motor control, the latest neurophysiology and other relevant concepts to be applied in your everyday sessions. 80 hours of anatomical tuition will be presented over five weekends and is soon to be CPD registered. These workshops are a foundation for all movement teachers, intending to refresh and restructure the practical and pathological approach to anatomical knowledge. They will leave the participants in a position of being able to interact confidently and knowledgeably with the client, peers and other related professionals. The workshops have been divided into five functional entities following anatomical divisions, which will include audio- visual presentation, interactive discussions, and practical sessions. Revise and learn new bony, muscular and fascial anatomyof the lumbar spine & SI joints. Learn relevant safety guidelines for various conditions. 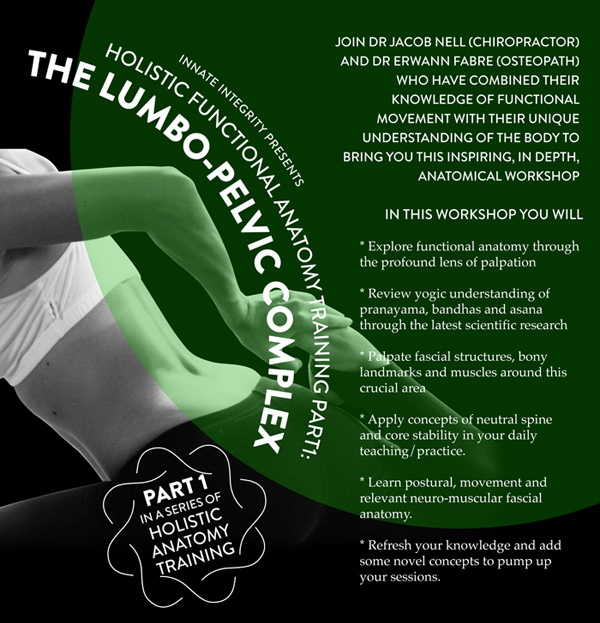 Learn and apply concepts of integrated spinal stabilization for the lumbo pelvis (bandhas, an in depth analysis of the “myth” of core stability). Learn the significance of pelvic micro movements to enhance flexibility and stability. Integrate with an understanding of breathing. Being the first of it’s kind in South Africa this is a must for all movement teachers.